This online program was designed by your care team to educate you, guide you, and connect you in order to manage your expectations and provide the best possible experience for your surgery and recovery. The second most common surgery amongst women in the US, there are approximately 600,000 hysterectomies performed every year. Though the procedure is common, it is considered a major surgery that requires patient coordination and compliance in order to standardize successful outcomes and reduce the risk for complications or long-term side-effects. Our FemmeCare for Hysterectomy Program incorporates ERAS protocols to optimize pre-surgical preparation, expedite recovery and manage use of pain medication. 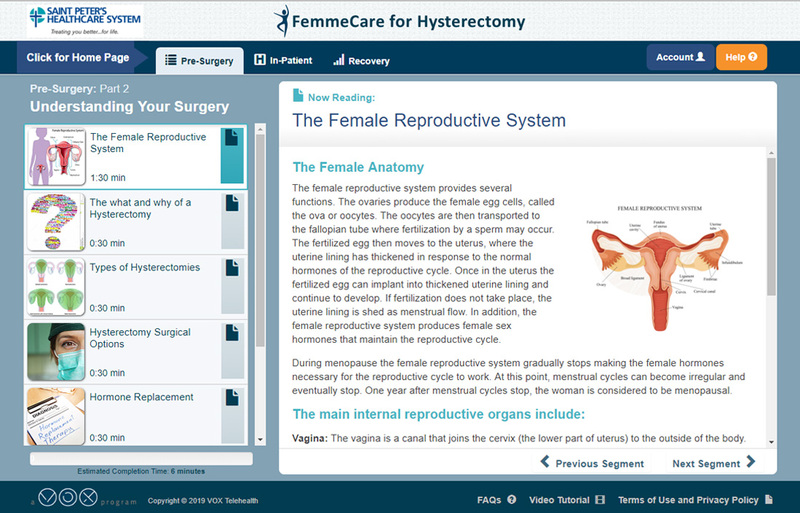 The Hysterectomy program teaches you how to be an active partner in your own care by providing the right information at the right time and by keeping you connected throughout your surgery and recovery pathway. The team at VOX Telehealth recognizes the importance of this decision and provides essential tools in a patient’s journey to surgery and recovery. At VOX, we believe “Health” is a state of complete physical, mental and social well-being. Promoting the health of women and children requires taking a holistic view of the clinical care services they receive, the policies that influence their health, the home environment and community in which they live, and their health behavior. Let us show you how you can improve patient outcomes, enhance their experience, and greatly reduce the cost of care.